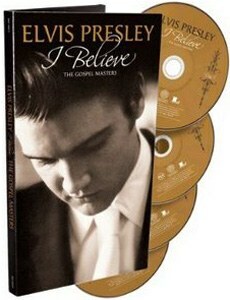 "I Believe – The Gospel Masters" is a BMG 4CD repackage of (nearly) all of Elvis’ gospel and inspirational Master recordings. While true Elvis fans will have bought most of these all-important recordings several times before BMG promises the best-quality remastered audio along with an interesting ‘Bonus’ CD. EIN's Piers Beagley looks for salvation and great music with an in-depth review of BMG's new major 2009 release. 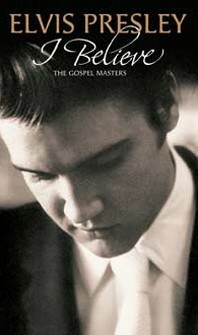 Released last month "I Believe – The Gospel Masters" is a BMG 4CD repackage of (nearly) all of Elvis’ gospel and inspirational Master recordings. While true Elvis fans will have bought most of these all-important recordings several times before BMG promises the best-quality remastered audio along with an interesting ‘Bonus’ CD. Of course the 3 CD set ‘Peace In the Valley’ released in 2000 was a similar compilation, however there has been a major improvement in audio quality over the last 10 years and for some reason I never thought the ‘Million Dollar Quartet’ gospel songs worked that well when taken out of context. There are in fact 19 songs less on this 4CD set than on the ‘Peace In The Valley’ compile! However with the audio improvement and track selection this new box-set is fast becoming a favourite. The audio remastering by Vic Anesini (‘Viva Las Vegas’, ‘Elvis Live’) is top-notch with the opportunity now to appreciate every nuance of these all-important sessions. The sound quality is similar to the great work on the ‘Close Up’ box-set with a real richness and full bass sound. Vic Anesini did similar impressive audio work on the earlier ‘Ultimate Gospel’ so fans who already purchased that will no doubt be enthusiastic to get all these Gospel songs in such magnificent sound. The box-set features a full-size 24 page booklet with a detailed article by Ernst Jorgensen and Mike Cimicata on the background to Elvis’ interest in Gospel music and these definitive recording sessions. 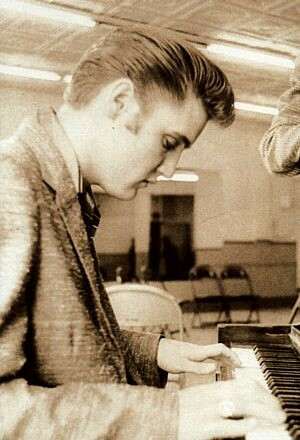 Of Elvis’ early years they interestingly note..
... It's hardly surprising that a young boy from rural Mississippi would be exposed to religious music from the earliest days of his life. His mother Gladys once told a reporter: 'When Elvis was just a little fellow, he would slide off my lap, run down the aisle, and scramble up to the platform of the church. He would stand looking up at the choir and try to sing with them. He was too little to know the words, but he could carry the tune'. As he grew older he would not only attend his own church, but also sneak in with friends and enjoy the even livelier services at the black neighborhood churches both in Tupelo and later in Memphis. With his parents and his girlfriend Dixie, they would often attend the all-night gospel sings at Ellis Auditorium in downtown Memphis. Gladys' favorite religious singers were The Blackwood Brothers, whereas Elvis and his father enjoyed the lively showmanship of The Statesmen Quartet and their incredible bass singer 'Big Chief'. So steeped in this music was Elvis that he often claimed to know every religious song ever written. Elvis was 13 when his family moved to Memphis, and five years later he tried out for The Blackwood Brothers' junior quartet. He was very disappointed when he learned that he flunked the audition. Discouraged, he related to his father that they had told him he couldn't sing. From the notes of a long lost tape from one of Elvis' earliest Sun sessions, there is evidence that he tried out Martha Carson's 'Satisfied', and at his early live performances, when his recorded repertoire was still extremely limited, he would sometimes throw in an a capella rendition of 'Amazing Grace' to fill out the show. 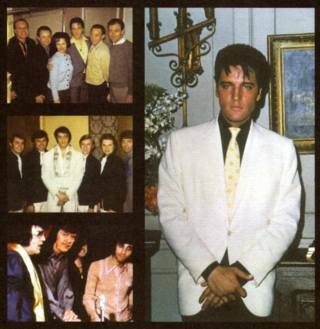 There are some fine photographs included from all stages of Elvis’ life, plus a page of colour shots of all of Elvis’ original gospel vinyl releases. The Alfred Wertheimer photographs (right) are particularly good in capturing Elvis at his most sincere and thoughtful moments. The box set uses eco-friendly cardboard edges to hold the CDs rather than the old fashioned plastic box-sets and the overall design is rather muted but still appealing. Roger Semon is credited with Art Direction and photo research. Rather unusually it is Ernst Jorgenson only who is credited as Compilation Producer. For once it is heartening to see a promo insert for other Elvis albums and DVDs, including the recent ‘Complete Comeback Special’. Discs 1 to 3 on "I Believe – The Gospel Masters" feature Elvis’ non-secular studio Master recordings in chronological order from his four key religious releases, the ‘Peace In The Valley’ EP plus the albums ‘His Hand In Mine,’ ‘How Great Thou Art,’ and ‘He Touched Me.’ Elvis’ three main Gospel recording sessions used very different arrangements and had a very different feel, so collating each era onto individual CDs works very well. 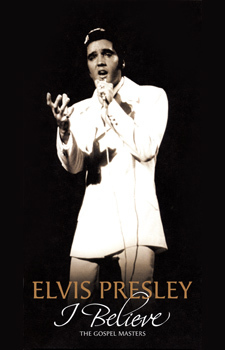 Disc 4 gathers up Elvis’ other Gospel and Inspirational recordings from his movies, the 68’ Comeback TV special, other live performances and home recordings. It is an interesting selection and it flows very nicely compared to the similar concept of the final CD of the ‘Peace In The Valley’ compilation. It includes ‘Down By The Riverside/When The Saints Go Marchin’ In’ (from Frankie And Johnny), ‘Sing You Children’ (from Easy Come, Easy Go), a fabulous new mix of the ‘Swing Down, Sweet Chariot’ (from The Trouble With Girls) and ‘Let Us Pray’ (from Change of Habit). 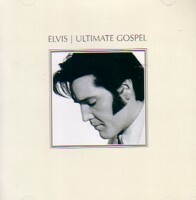 The CD ends with the informal Gospel session with Elvis plus J.D. Sumner and The Stamps having fun while working on the film ‘On Tour’ followed by the three key religious songs recorded at Elvis' L.A. Rocca Place home while preparing for the ‘How Great Thou Art’ album in 1966. Mini Verdict: While EIN was wary of purchasing these same tracks for the umpteenth time the sensational new audio quality adds a new depth to this all-important music, and with the box-set selling at a very reasonable price I can heartily recommend it. Gospel fans should note that this new box-set does feature the same audio remasters as on last year’s BMG released individual upgraded versions of Elvis’ three Gospel albums. Disc 1 – 44 minutes. 1957 – 1960. CD1 starts with this compile’s key song, 'I Believe' the first Gospel song Elvis professionally recorded in a studio back on January 12th 1957. This was a song that had been recorded by one of Elvis’ idols Roy Hamilton. Continuing with the stunning ‘Peace In the Valley’ the CD leads you through Elvis’ earlier gospel songs in the chronological order in which he recorded them. There is a real delight when the ‘His Hand In Mine’ performances start with ‘Milky White Way’ as the recordings then burst into beautiful (remastered) Stereo and you can absorb the sweep of Elvis’ post-army newly re-assured vocals. His rich deeper voice, along with his new confidence of the fabulous range of his voice, perfectly suit these gospel songs. "My personal favorite is ‘Known Only To Him.' The words to this song touched Elvis' heart and are meaningful to me every time I hear it. He was such a beautiful soul, and you can hear it in his voice in these recordings. That's what those of us who knew Elvis loved about him." There is also the fascination in knowing that at the time there was a positive rejection - presumably by Elvis - of ‘Crying In the Chapel’ with "no satisfactory master" being noted on the studio log. Listening to it here one has to wonder exactly what other perfection Elvis could have been searching for. With the dawn of the next day already rising, the session ended with ‘Working On A Building’ one of The Jordanaire’s own successful numbers. With a real smoothness and with Elvis letting the Jordanaires lead the way the 1960 session – which also included Elvis’ future #1 single ‘Surrender’ – was wrapped up. With Elvis releasing little of creative note, seemingly lost and only driven by Colonel Parker’s movie/travelogue Soundtrack albums the May 1966 ‘How Great thou Art’ session was breakthrough. Consider the fact that just three months before Elvis had been recording ‘Beach Shack’ and the dreadful ‘Smorgasbord’ for the Spinout soundtrack – and sadly just a month after thisi fabulous session Elvis would then be forced to record ‘Old MacDonald’ for Double Trouble! By 1966 there had been a leap in studio technology as well as music production. The lightweight pop of the early sixties had been replaced by chart-topping songs with insight and deeper meaning. In the charts the fluff of Pat Boone had been replaced by the creativity and sincerity of Bob Dylan. So bouncing off the delayed success of ‘Crying In the Chapel’ – and no doubt dismayed by the lightness of his soundtrack sessions - Elvis decided to create a deeper choral sound to his new religious recordings. For this session Elvis hired not only The Jordanaires but also The Imperials, plus the female counterpoints of Millie Kirkham, June Page and Dolores Edgin. If you have ever visited Studio B you have to wonder how everybody managed to squeeze in! Songs like ‘Run On’, ‘So High’ and ‘If The Lord Wasn’t Walking By My Side’ capture the richness of this multi-layered choral sound, as well as the feel of Elvis’ singing for his musical freedom and salvation within this Gospel church session. ‘Stand By Me’ (surely one of his best-ever Gospel songs) and ‘Without Him’ show another side to the session with both songs supremely touching and with Elvis revealing his lonely and open soul for all to see. Considering the fact that Elvis’ enforced 9-5 Col Parker day-job was soon to be the movie ‘Double Trouble’ no wonder Elvis sang for the salvation of his soul. Go back and listen again – Has the "hummmmmm" and the intro to ‘Run On’ ever sounded so clear? Just the first ten seconds of the song, as Elvis’ vocal bursts forth, are one of Elvis’ keys to his future musical recovery. Other important songs such as ‘Love Letters’ and Dylan’s ‘Tomorrow Is A Long Time’ were also recorded within this 3-day session. It is a real shame that the exquisite ‘Where Could I Go But To The Lord’ was captured in one masterful take. Again Elvis managed to produce pure soulful magic as the sun came up. How good would it have been to hear Elvis working through a longer session on this true classic? But it was a perfect end to a fantastic night of recording. In this quality make sure you listen to the backing vocals (worthy of putting your headphones on) with girls on the left channel, guys on the right channel and with Elvis’ pure vocal right in the centre leading them all on to glory. ‘You’ll Never Walk Alone’ and ‘We Call On Him’ from 16 months later again capture Elvis restating his musical intentions while trying to compensate for the fluff of the four movie soundtrack sessions that he had just fulfilled in that short period. "On the last night of sessions, he sat down at the piano and asked for the lights to be turned down. He started playing 'You'll Never Walk Alone' over and over, not pausing between takes, just endlessly repeating, driving every bit of emotion from the song, seemingly lost in his own world, just like he had done so often at home, after everybody else had gone to bed. Felton Jarvis took the tapes and simply edited his way to a final master with a radio-friendly running time. Although not a commercial success', You'll Never Walk Alone' earned Elvis another Grammy nomination." The sincerity and drama that Elvis managed to convey in the spontaneous ‘You’ll Never Walk Alone’ is astounding. For some reason these tracks are listed in the incorrect playing order in the booklet. In fact Elvis recorded ‘We Call On Him’ as the song before ‘You’ll Never Walk Alone’ so the chronology has been swapped here to fit the flow of the tracks. ‘Who Am I’ was the oddity of being the only Gospel number recorded during the ’69 American Studio sessions and then was only released two years later on the Camden budget LP ‘You’ll Never Walk Alone.’ Unfortunately with its overdubbed country violins ‘Who Am I’ doesn’t quite match with the other religious songs and it would be interesting to hear the undubbed studio version. There is an excitement in the seventies Gospel CD since it kicks off with the spontaneous 'I Was Born About Ten Thousand Years Ago' with it sounding like Elvis’ is challenging himself to keep up the authenticity and feel in these later recordings. A track not featured on any Gospel compile so far makes it a fine introduction. ‘Life’ while not everybody’s favourite track (what a terrible choice for a single!) seems to have grown in appeal over the years. Maybe I’m just getting older or perhaps the other truth is that the importance of "nature and the breath of life" has increased as we head into climatic disasters. ‘Only Believe’ while a lesser Gospel classic sounds so much more dynamic and impressive with updated remastering - and similarly Elvis’ inspired vocal and arrangement on ‘Amazing Grace’ is breathtaking. Crank it up! On the ‘He Touched Me’ May & June 1971 sessions Elvis used his American Studio band along with James Burton which helped put some Memphis soulful stew into these Nashville recordings. There are some real Gospel classics here with the delicious ‘Lead Me, Guide Me’, ‘He Touched Me’, ‘I, John’, ‘Bosom Of Abraham’ and ‘Reach Out To Jesus’ all sounding as good and sincere as any of Elvis’ Gospel recordings of his career. Elvis’ vocal and performance on these songs is superb. On ‘Bosom Of Abraham’ Elvis slides his vocal from baritone to tenor, to deep-bass and back! The slight crack in his voice @0:22 is all the more live-church-session inspiring. What a shame that the song runs so short. Others however such as ‘I've Got Confidence’, ‘Put Your Hand In The Hand’ and ‘Seeing Is Believing’ all have a very mid-seventies feel and so haven’t dated as well. On these songs it is noticeable that at points Elvis also sounds less than enthused himself. Coming from England where ‘There Goes My Everything’ from 1970 was a Top Ten single A-side I have always been fascinated by the alternate religious version ‘He Is My Everything’ that Elvis decided to record one year later. Finally there are three very fine tracks from Elvis’ December 1973 STAX sessions. On the previous popular Gospel compile Amazing Grace, ‘I Got a Feeling In My Body’ was left off while for some reason the wonderful ‘If That Isn’t Love’ didn’t appear on the expanded ‘He Touched Me’ re-release from last year. The sound on these three are deliciously rich compared to the earlier box-set releases. Here the vocal overdubs do work in adding a moving choral sound of inspiration. ‘If That Isn’t Love’ makes for a magnificent final song. - But wait, there’s still more! Disc 4 – 50 minutes. 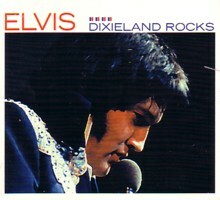 The final CD works as a mop-up of Elvis’ non-secular performances that were recorded outside these main studio sessions. And because of the eclectic nature of these sources, movies, live shows, home recordings, it is this disc that is the most enthralling of the whole set. I suspect that leaving the Million Dollar Quartet songs off the compile will also work for most fans. From 1965’s Frankie And Johnny ‘When the Saints Go Marching In / Down By the Riverside‘ through to 1974’s ‘How Great Thou Art’ from ‘Live On Stage In Memphis '74’ Elvis’ Gospel roots were ever-present. ‘Swing Down, Sweet Chariot’ from ‘The Trouble With Girls’ recording sessions is taken at a faster tempo than Elvis’ original and is particularly impressive. At last Elvis sounds like he was enjoying singing a sixties movie song - and how strange that this gem was never released until 1983. Elvis’ vocal here actually sounds more committed than on his earlier 1960 version where he deliberately gave The Jordanaires more space to sing. Of real interest to collectors will be the fact that ‘Swing Down, Sweet Chariot’ here is a very different mix. From the very start it is The Blossoms female vocal group that take the lead and follow Elvis’ vocal throughout. On the previous version – which is the same Elvis vocal track - it has always been The Mello Men doing these gospel backing-vocals. In Jorgensen’s book ‘A Life In Music’ it states that The Blossoms were only there for a vocal overdub on ‘Clean Up Your Own Backyard’ but maybe they also overdubbed this number too. Whatever the reason this track is a real highlight. The ’68 Gospel Medley with Elvis’ statement "Rock ’n’ roll music is basically Gospel or Rhythm and Blues .. it sprang from that" fits perfectly here, leading to the inspirational ‘If I Can Dream.’ While this song has not been included on any Gospel collections before, its inspirational lyrics are flawless within this context. "Although not strictly speaking a gospel song, ‘If I Can Dream' purveyed both a sincerity and spirituality that was as sincere a statement as any of the traditional spirituals he sang." The three ‘Live On Stage In Memphis’ tracks that follow ‘Help Me’, ‘Why Me, Lord’ and ‘How Great Thou Art’ sound marvellous in this remastered quality and you can really hear the bass rumble. However I am a little disappointed that they still use the so unnecessary fake audience overdubs that were added to the original LP release. There is another mistake here in the booklet and the sleeve since they both list these tracks in the incorrect playing order. ‘How Great Thou Art’ is the final of the three here - although at the concert it was ‘Help Me’ that was the final gospel song. Finally we get 8 ‘Bonus Songs’ taken from informal sessions. The five songs from the ‘On Tour’ gospel jam around the piano sound wonderful with the new fuller sound letting the bass-harmonies really show. This helps capture the ambience and closeness to the spontaneity of Elvis singing for pure enjoyment. You can imagine that Elvis’ post concert musical jams in his hotel suite would be similar and wonderful sessions to have been privy to. Interestingly it also includes Elvis’ comment beforehand "Let’s do it like we did on the record.. and sing the bass" which was edited out of the ‘Amazing Grace’ box-set version. In contrast the preliminary studio banter before ‘Lead Me, Guide Me’ on the previous release is now missing here. On ‘Lead Me, Guide Me’ this 1972 version sounds magnificent and again is imbued with a deeper resonance and sincerity that is slightly lost on the 1971 studio recording. To end three home recordings of Elvis at his Rocca Place, Hollywood home are included. ‘Show Me Thy Ways, O Lord’ is particularly moving. While the audio is better the slight peak distortion of the original recordings is still apparent, though less grating. As always with these collections one has personal preferences and I would have loved to have seen included the Ed Sullivan ‘Peace In the Valley’ as the final track. ‘Farther Along’ and ‘Oh Happy Day’ would also have worked as additions at the start of the ‘Bonus Tracks’ however these are minor quibbles. "Despite all the millions of sales and the three Grammy Awards, what towers in importance is the timeless music Elvis left behind. Church music, inspirational, hymns or gospel – the labels meant nothing to him. As with everything he ever sang, Elvis merged all the elements into his own belief of what music should be, free of any constraints of genre. Elvis' religious music afforded him more creative freedom than any other music he made, as no one had the knowledge to challenge him, and no one dared. " Overall Verdict: This is a quality BMG release with a nice booklet and four well-selected CDs of the best of Elvis’ Gospel sessions and at a very reasonable price. The 8-page essay looking at Elvis' early musical influences and his Gospel sessions is of interest and splitting Elvis’ sessions into these 4 individual eras works very well. The improvement in sound gives the songs a rich and warm feel, which suits the delicious gospel harmonies. Disovering a different version of the 1968 'Swing Down, Sweet Chariot' will be of real interest to hard-core collectors. Of course if you did purchase the individual BMG Gospel album re-releases of last year then it is only the upgraded forth CD that you need here. However if your Elvis budget is limited and like me you couldn’t afford those at the time then this is the perfect package. Looking closer at the audio quality most tracks are of course similar to Vic Anesini's work on ‘Ultimate Gospel’ & BMG 'Inspirational' Masters. The ‘68 'Gospel Medley' is same as on the 40th Anniversary box-set coming from the poor quality LP Master tape. This surely means that Vic Anesini doesn’t have any better option for the up-coming special complete CD Masters box-set. 'If I Can Dream' is however not the 40th Anniversary Master version but the same as the fabulous 2006 BMG 'Inspirational' version. Most other tracks are similar to Vic Anesini's previous Gospel re-masters however the filters here have been changed in the Mastering with slightly more "top end" to the tracks. (i.e. you can hear more tape hiss presence in the 50's tracks). There is also a fuller, richer bass sound to the majority of the songs. On 'Amazing Grace' you can hear the bass flutter of the actual tape - even more so than on the very fine BMG 'Inspirational' version. The omission of ‘Miracle Of The Rosary’ - a mistake or not? It is interesting to note that when BMG's 'Ultimate Gospel' CD was re-released in 2007 it was accompanied by the promotional blurb stating "Revised with 2 significant tracks added - and artwork not previously included." The songs 'In My Father's House' and 'An Evening Prayer' were indeed added but more peculiarly the track 'Miracle Of The Rosary' was removed! While of course the track is a "Catholic" song, it does demonstrate that Elvis liked it enough to record it and that Elvis showed no bias. Some religious sectors would of course not see this as a "gospel"' song, however if this compilation includes an "Inspirational" recording such as 'If I Can Dream' it makes no sense for ‘Miracle Of The Rosary’ to be omitted. Especially as it has been on other previous BMG Gospel compilations. EIN review of 'Ultimate Gospel'. Great review! I love Elvis' Gospel music. I have all the major mainline releases plus His Hand In Mine (FTD). I'm sure I'll purchase the FTD versions of How Great Thou Art and He Touched Me when they get around to them. I'm glad they omitted the MDQ tracks and most of the home recordings. I also feel that the MDQ tracks don't work out of context. The general lo-fi quality of home rcordings grates on my ears. I can't imagine the general public warming to these at all. I would much rather have had Talk About the Good Times; Mama Liked The Roses; Where Did Thy Go Lord; or even Padre. I know none of them are gospel strictly speaking, but they'd fit in. And where was Miracle of the Rosary? Yes, it's a "Catholic" song but Elvis liked it enough to record it. There is possibly something strange going on when the song is yanked from the updated Ultimate Gospel and then doesn't appear on this set. Not a bad review however anyone who would want "Miracle Of The Rosery" included on a "GOSPEL" set knows nothing about God's Word. In fact, Elvis should have known better for recording such a song of godess worship. This is a great Gospel set. The depth of stereo sound is wonderful and I am happy to have bought these songs all over again. Hopefully this will be the last time I feel the need to. Disc 4 is fabulous on this set. Swing Down Sweet Chariot sounds so different it could be a different Elvis vocal track than the one we know. There are a few differences soundwise with the ones on Ultimate Gospel and Christmas Peace but if you like the original masters this is the set you need. I just got the box myself and was really surprised how slim the whole cardboard package is, unfortunately the quality of the booklet has suffered also, with the low grade paper they've been using here some of the text becomes very hard to read and most pictures look quite washed out. It's really a shame they couldn't at least use quality photo paper for that one (the cost cutting has really gone too far here and I can only hope the discs will not get ruined by the cardboard). I'm still trying to make my way through most of the content on the set but one thing I've noticed are the Memphis 1974 live tracks and they are indeed the original mixes which have now been remastered (for the very first time!) and they do sound great. I compared the sound of these tracks to my reference CD for this show (the 1986 Japan CD release R32P-1054) and the new remasters come very, very close, in fact there's not really much of a difference. Hopefully Sony will re-release the original album one day in the same remastered quality.